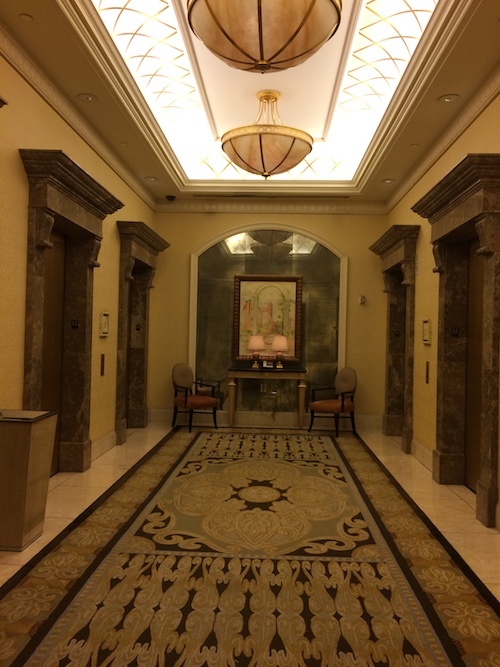 As frequent visitors to Las Vegas for the past 25 years, we have stayed at more than 15 properties – on and off of the Strip – ranging from the Flamingo to the Mandarin Oriental. 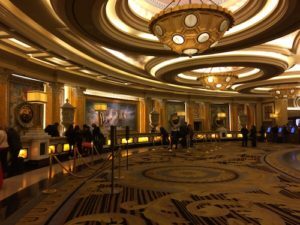 So in January we stayed at Caesars for the first time. We had frequented the property for many years when it hosted major boxing matches. Our first was “The War” in 1989, between Sugar Ray Leonard and Thomas Hearns. We have also been regular visitors to their Qua Roman Baths and Spa and regular shoppers at the Forum Shops. 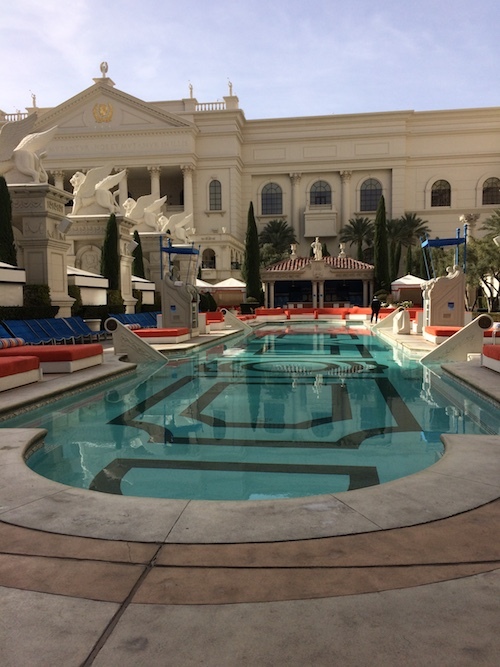 We’ve watched Caesars grow through the years, becoming one of the largest resorts on the Strip. So we wanted to find out what the experience would be like as hotel guests. We took a shuttle from the airport and upon arrival found that the hotel drop-off area was uncovered and a distance from the front entrance. There was no one in that area to assist with luggage. That is definitely an inconvenience in inclement weather. So if it had been raining or triple-digit temperatures (as is often the case during summer months) we would have been very uncomfortable after being dropped off, and waiting to be picked up. There is no covered shelter to protect from the elements. That area is also the designated drop off/pickup point for Uber and Lyft drivers. There is no clear walkway from that area to the entrance so we had to maneuver our way through traffic, over uneven surfaces to enter the resort. When we made it to the check-in desk, and presented our reservation confirmation we were greeted warmly and processed fairly quickly. It was 1:30pm and check-in time is 3:00pm. This is normal procedure at hotels, but often there are rooms available and guests are allowed to check in early. We were told that there were no rooms available yet, and advised to leave our luggage at the bell desk. Then we were presented with and option – if we paid $30.00 a room would be available. We chose to utilize that option. However, we viewed that as an upsell. 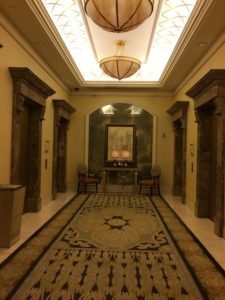 We have stayed at fine hotels all over the world, and have never had to pay for early check in. If a room is available, we’re normally allowed to check in. It was apparent that rooms were available, but not until we paid the $30.00. This is an unnecessary upsell and a deterrent. Locating the room was an adventure in itself. 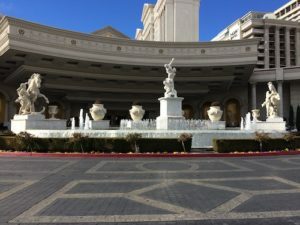 Caesars is a 50 year-old property that started as a single hotel, but has grown into a maze of separate towers, connected in very disjointed ways. Signage is confusing, at best. Getting around the property is similar to maneuvering a maze. We stayed in the Palace Tower in a standard king room on the 26th floor, overlooking the pool. The room was spacious, clean, well-furnished and even offered a Jacuzzi tub. However, there was a letter in the room, informing us of construction due to remodeling. We should have been informed of that at the front desk. We did find the noise disruptive and registered a complaint. They did offer a change of room. The Palace Tower is one of the oldest, and getting to the elevators requires walking through an area lined with shops and salons on both sides. Guests passing through this area are constantly solicited by aggressive shopkeepers. We were accosted each time we entered and exited the tower – VERY annoying. That sort of behavior is expected out on the Strip, but certainly not inside of your hotel tower. 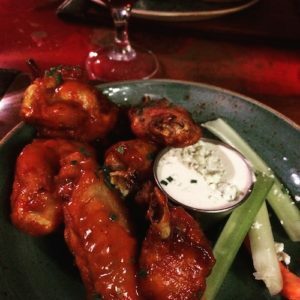 DINING: The dining options are plentiful – from fine dining, to the food court – and service is excellent. 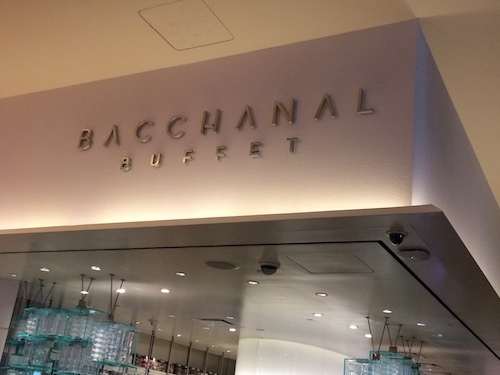 The Bacchanal Buffet is one of the best in Las Vegas. We also enjoyed Gordon Ramsay’s Pub and Grill that served great pub food and the service is exceptional. Prices at all of the eating establishments (with the exception of the food court) would be considered $$$, so it is not the place to “eat on the cheap”. Since it was January, we did not utilize the swimming pool. But walked around the area and examined the cabanas. The area is well maintained with marble statues and pretty landscaping. No doubt it is a happening place during the warmer months. GAMING: Table games and slots are plentiful, covering much of the casino floor. There is a large Sports Book, with very large high-quality screens. However, it is poorly lit and with the layout, it is difficult to see the betting boards. Also, free seating is limited, there are only a few free seats in the very front row; which only allows a distorted view of the screens and the betting boards. The remaining seats must be reserved – at a price. In many of the other resort casinos on the Strip (Venetian, Palazzo, Wynn, Encore, Aria) free seats are plentiful. 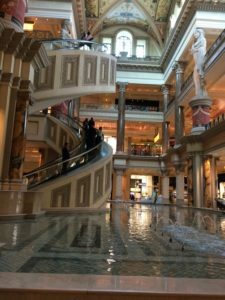 SHOPPING: The Forum Shops still offers a great shopping experience, with shops and boutiques by many of the world’s top designers. It is well laid out and beautifully designed. 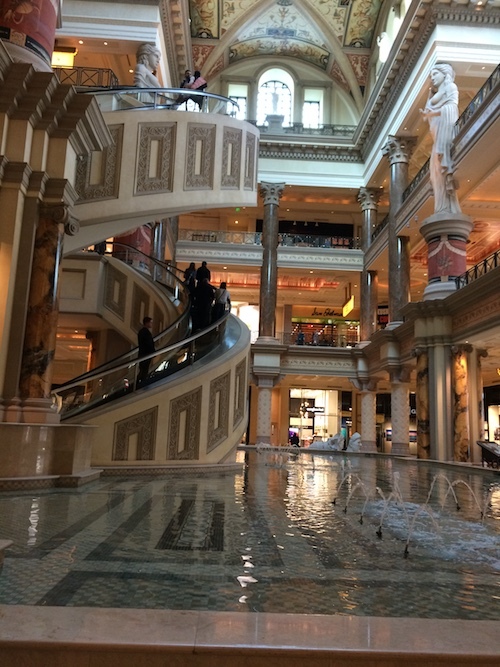 It features the Roman theme and even has a small replica of the Trevi Fountain. The “Fall of Atlantis” show is not to be missed. With the dramatic music and moving statues, it is one of the best free shows on the Strip. 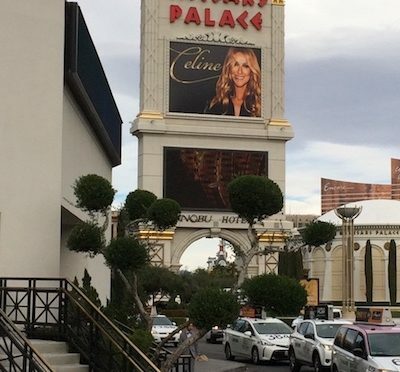 ENTERTAINMENT: There are a good number of nightlife options, including the Omnia Nightclub and the Colosseum where many of the world’s top entertainers like Celine Dion and Elton John perform. Caesars is priced like many of the other luxury resorts on the Strip, but the overall experience does not compare. I would consider it a 3 star property with a few 4 star elements. Paris has many nicknames, but its most famous is “La Ville-Lumiere” (usually translated as “The City of Lights” or as “The City of Light”), a name it owes to both to its fame as a center of education and ideas and its early adoption of street lighting. 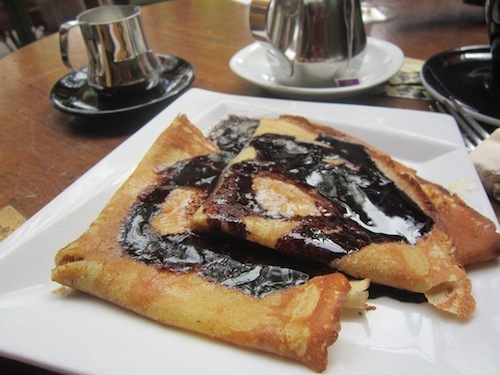 Paris is also known for its culinary choices and is a magnet for foodies from all over the globe. With such a plethora of choices, where does a first-time visitor begin? I recently discovered a great little book to help answer that question. 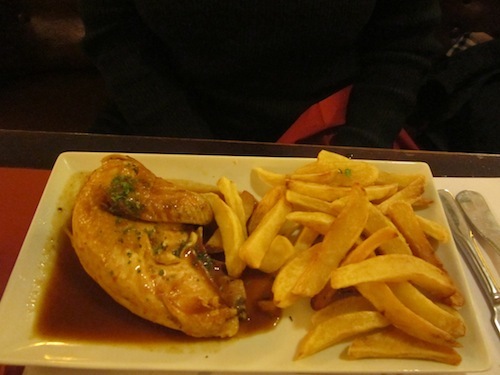 It is called “Dining Out in Paris” by Tom Reeves. If you are a Francophile you’ve probably already compiled a list of your favorite Paris restaurants. But if you are an infrequent visitor – or have never been to Paris – this is an excellent beginner’s guide. It tells what you should know before you go to the City of Light. The book is comprised of easy-to-read descriptions and beautiful color photographs. I especially enjoyed the author’s detailed descriptions of types of dining establishments; restaurants, cafes, bistros, brasseries, salons de the, bars a vin, even neighborhood food shops; and what to expect in each one. 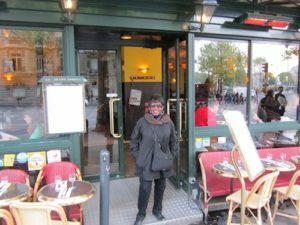 FOREIGN RESTAURANTS: Paris has many foreign (non-French) restaurants, so one can enjoy cuisine from all over the globe. SERVICE: The concept of service is very different from what many Americans have come to expect. The pace is leisurely, not rushed. The server allows the customer to set the pace. The goal is not to have multiple customers per table each night, but perhaps only 1-2 seatings per table. TIPPING: A service charge of 15% is always included in the bill, so leaving a tip is unnecessary. However, if one wishes to recognize exceptional service, it is customary to leave an additional tip; normally 5%. However, this must be in cash because it cannot be added to a credit card charge. 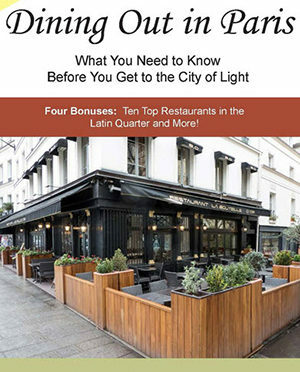 The book also includes detailed reviews of several top restaurants and fine-food stores in or near the Latin Quarter. So it is a wonderful beginner’s guide to dining in Paris that covers everything from picnicking to fine dining. I recommend it highly and I wish I’d had the opportunity to read the book before my first trip to Paris. But I’ll definitely have it with me the next time I go.